Bardhaman district, a part of the Bardhaman Division, is bounded on the north by Dumka (of Jharkhand State), Birbhum and Murshidabad, on the east by Nadia, on the south by Hooghly, Bankura and Purulia and on the west by Dhanbad (Jharkhand). The river Barakar forms the boundary to the west, Ajay separates Birbhum and Dumka to the north with the exception of a portion of the Katwa subdivision, the Damodar forms a southern boundary with Purulia and Bankura, while Bhagirathi forms the main eastern boundary. The known history of Bardhaman stretches back to 5000 BCE, in the Late Stone Age. The first epigraphic reference to the name occurs in a 6th Century CE copper plate found in the village of Mallasarul in the Galsi Police Station area. The origin of its name is ascribed to Vardhaman Swami or Mahavira (599-527 BCE), the 24th Tirthankara of Jainism who spent some time in Astikagrama, according to the Jain scripture of Kalpasutra. Another view is that the word ‘Bardhamana’ means ‘centre of prosperous growth’; and because in the progress of Aryanisation from the upper Ganges valley, the frontier colony became a land of growth and prosperity; it earned the name “Bardhaman”. 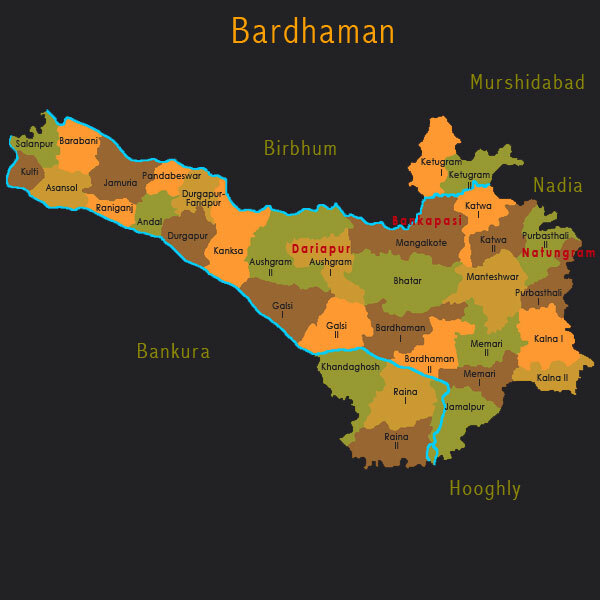 Bardhaman city, the district headquarters, is historically important as the capital of the Maharajas of Bardhaman, the premier noblemen of lower Bengal. Bardhman Raj was founded in 1657 by Sangam Rai, who belonged to the Kapoor Khatri family of Kotli in Lahore, Punjab. His descendants went on to serve first the Mughal Emperors and then the British Government. Bardhaman is the only district in the state of West Bengal that is both industrially and agriculturally developed. Around 58 % of its population belongs to the agricultural sector while the non-agricultural sector accounts for the remaining 42%. The agricultural yields in the district has improved significantly since 1953 with the implementation of irrigation projects undertaken by the Damodar Valley Corporation. Rice, in its numerous varieties, is the most important crop of the district while commercial crops like jute, sugarcane, potato and oil seeds are cultivated in marginal areas. The industrialized zone of the district comprises areas under Asansol subdivision and Durgapur subdivision. The various five year plans created the new industrial areas of Durgapur and Chittaranjan, developing urban centres in the region, such as Asansol, Kulti, Burnpur and Raniganj. According to the 2011 Census, the total population of the Bardhaman district is 7,723,663 of which 38.87% lives in urban areas while 60.13% lives in villages. The state government has recently taken an administrative decision to bifurcate this district and create a new district comprising the industrially developed subdivisions of Durgapur and Asansol. Bardhaman has a multi-cultural heritage. The rekha-deul temples of the Sakta and Vaishnava tradition, which combine a northern-style tower (or rekha-deul in Odissi terminology) with a southern style hall found here are reminiscent of Hindu architecture. Several tombs and dargas bear witness to an Islamic cultural influence in the district. Pirbaharam Shikha (the tomb of Sher Afgan, subject of the Mughal emperor Akbar and Subedar of Bengal), Khwaja Anwar Berh (the tomb of Khwaja Anwar, a famous Mughal warrior), Shah Ama’s Darga (a building of considerable archaeological interest, built by Subedar Murshid Quli Jafar Khan in the 18th century) are some of the remarkable pieces of Muslim architecture in Bardhaman. Karuja crafts village, spread over 5.3 acres of land in Malkita village is devoted to the development of handicrafts and folk culture. Karuja produces different creations of Dokra (metalwork), carved wood, Shola pith work, straw work, kantha work (traditional quilt art), leather and jute and also traditional musical instruments. Karuja promotes a variety of folk artists and also has a Gurukul or residential learning facility for the next generation of folk artists.